The Palestinian energy authority in Gaza announced on Monday evening that the only power plant in the Strip had shut down after running out of fuel, Anadolu agency reported. According to the statement, shutting the plant down would further disrupt the electricity distribution schedule, which currently involves between 12 to 16 hours off and only eight to 12 hours on. Following the shortage, the distribution of electricity in the Strip is down to around six hours a day. In March, after a complete shutdown of the plant, the Palestinian national unity government said it exempted the electricity plant from paying the imposed taxes for a period of three months. The energy authority in Gaza is attempting to purchase the fuel for the plant without paying the $0.80 per litre tax required by the Palestinian Authority (PA) based in the West Bank. The plant requires 550,000 litres (145,000 gallons) of fuel per day to produce at capacity, the energy authority says, meaning a daily charge of $440,000. Gaza is blockaded and controlled by both the Israeli occupation and Egypt. Both impose severe restrictions on the movement of people and all kinds of goods, including fuel for the electricity plant. 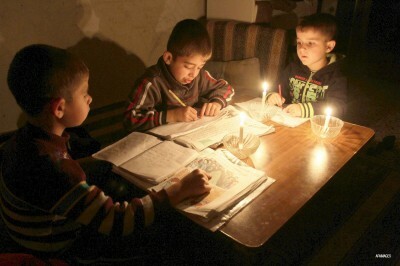 Gaza needs 400 megawatts of electricity per day but is currently producing only around 212. The electricity plant in Gaza produces 60 megawatts a day, which is supplemented by the 120 megawatts the energy authority buys from Israel and the 32 megawatts it buys from Egypt.